Wired alarm systems were the first type of alarm systems introduced to Ireland and are still installed today. In most cases when a new house is under construction the builder will pre install the alarm cables. This reduces the appearance of unsightly cables and it also reduces the need for large junction boxes around your home. These boxes are used to connect the cables on route to the alarm panel. If you have an older alarm system and it needs to be updated then the best way to go forward is to use the existing cables as they don’t usually wear out. Our engineers will test the cables for any faults during the installation. We can also connect a large amount of equipment to a wired alarm including remote controls, smoke detectors, motion pir beams, carbon monoxide detectors and mobile phones. If you have your alarm system connected to your mobile you will receive a message to your phone in the event of an activation .This could be caused by an intruder a smoke detector or a carbon detector. You can then return to your home to deal with the system. If you leave your home in the morning and forget to set alarm system, then you can simply text your alarm with code to set system. Esp are a fully licensed member of the NSAI and the PSA. It is illegal to install alarm systems if you are not a licensed company. 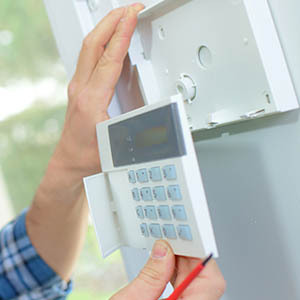 As a leading alarm installation company for over twenty years, we can supply any customer with a list of references for previous alarm installations on any home security systems we have installed. Esp carries out a full survey of all properties before we recommend what security installation to install. This is a free service. Esp Security have installed HKC Panels on 99% of all alarm installations for the last sixteen years. HKC are located in Ballymount in Dublin, so its great to know that when we use a very reliable alarm panel we are also helping to keep jobs in Ireland. We provide 24 back up for all home security installations including cctv installations, intercom installations, and security lighting installations. Esp is proud of the amount of work we receive by “word of mouth”. It is a very large part of the alarm installation work we carry out each year and proves we are doing a great job for our customers. ESP security installs wired alarms in Dublin, Kildare, Louth & Meath.